For the past couple of years weddings have been all about pastels – blush pink and washed out colours, rooms decorated with vintage details and floaty whimsical flowers …. But the tide is about to turn. The bold statement colours are making a comeback and having seen this red berry and navy wedding inspiration you can’t help but feel excited about it. If you have followed Engage Weddings for a while, you will know that it’s more than just a wedding inspiration blog. Engage Weddings is built on a community of local wedding business owners who are passionate about helping local couples from across Hertfordshire, Bedfordshire, Buckinghamshire and Cambridgeshire achieve their dream wedding day. When I heard that some of my favourite local suppliers were getting together to create a locally inspired wedding inspiration shoot just for you I was thrilled. This shoot is a collaboration between some incredible local talent – ready to excite and inspire you to be bold with the choices for your wedding day. Sit back, be inspired and enjoy these beautiful red berry and navy inspired wedding ideas. When Hertfordshire based wedding photographer Lee Rushby and venue stylist Sara Carlin (Venue styling by Sara) got together to create this shoot, I knew they would create something spectacular. They wanted to create something that would stand out from the crowd, and appeal to a creative, fashionable couple, to inspire those wanting to make bold choices for their wedding day. Sara describes the images as ‘romantic, atmospheric and a little bit moody’ with a strong colour palette of red bery, navy and gold. They are bold but beautiful choices which create a rich, warm wedding scene. Rothamsted Manor is nestled in the Hertfordshire countryside just on the edge of Harpenden. The manor house is a secret gem, and is relatively unknown, even to the locals. This stunning house was established in 1623 and provides the perfect back drop for this wedding inspiration shoot. The Oak panelled walls work perfectly with the Red berry and navy wedding colours to provide a gorgeous, elegant setting. The Grand Dining table, set out in the Great drawing room of Rothamsted manor is the focus of this wedding inspiration shoot. The table is dressed with luxurious silk flowers from Hertfordshire based Iris Design as well as some beautiful flourishes of Red Berry, Navy and Gold. The sea of flowers along with candles, lanterns and geometric shapes flow throughout the images and remind you of the importance of the little styling details that Sara has added. The room was lit by Hertfordshire based BlueMark entertainment, the blue and purple lighting is incredibly atmospheric and brings the room to life. Never underestimate the importance of lighting on your wedding day – it can totally transform a room. The couple featured in the inspiration shoot are Sarah and Josh, an engaged couple based locally in Bedfordshire. The chemistry in the photographs is obvious and you can that they are truly in love. Sarah, originally from the US, has recently moved to the UK to be united to her beloved fiancé and they are due to get married later this summer. Sarah is dressed in a stunning, elegant bridal gown from George James Bridal in Bedford. The lace back is the highlight of this gown, and I love the way it effortlessly floats to the ground. The ivory dress against the pop of colour is stunning, and remind us why these bold colours need to make their comeback. Bedfordshire based makeup artist and hairstylist Emma Morris created two looks for the bride on the day. 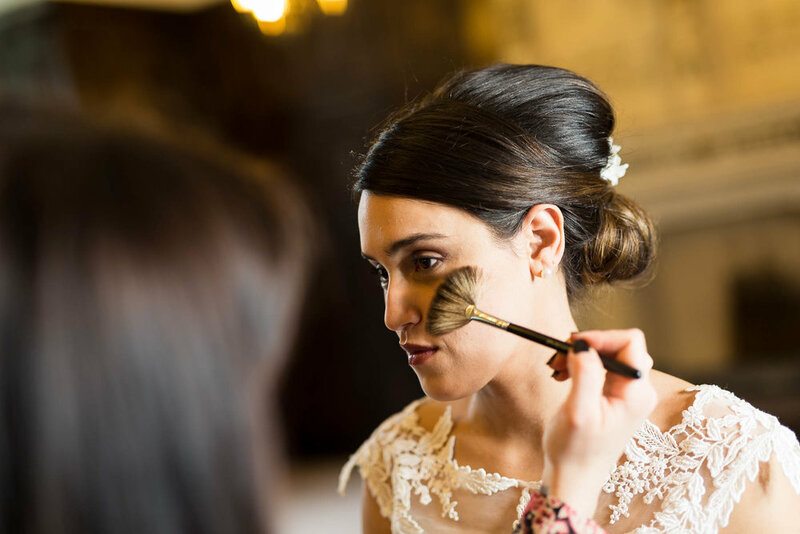 A natural, classic bridal look to start, followed by more dramatic makeup being added towards the end of the day for the moodier, stylised photographs. The beautiful bridal updo has been finished off with stunning bespoke hair accessories from Bedfordshire based Rachel Louise Designs. Rachel designs each of her pieces with the brides hair style and dress in mind to ensure they have something completely bespoke. The first piece is clipped delicately in the back of the brides hair, whereas the second, bolder piece beautifully frames the brides face. Josh is dressed in a gorgeous tweed suit from The Vintage Suit Hire company in Bedford. His accessories complement the Red berry and navy theme and he even has a decorative pocket watch to complete his look. The button holes bring the look to life with their beautiful bold colours against the grey suit. This beautiful, bold wedding cake has been expertly created by Bedfordshire based La Belle Cake company. The stunning bold colours weaving in the red berry, navy and gold theme are sensational. This wedding cake shows that being brave with your colour choices, will certainly give your guests the wow factor. Sara (Venue styling by Sara) has done an incredible job at styling each area of this wedding shoot to beautifully incorporate the red berry and navy theme. Geometric shapes and candelabras are at the forefront of wedding trends this year and continue to impress me every time I see them. It's always the little details that impress me the most at a wedding. The details show that the couple have spent time thinking through every moment of their day, and show how much they care. I love the details in this photo shoot, from the lovely sweet treat favours from Bomboniere by Maria that complete the place settings to the table plan and stationery from Sarah Ardrey Designs. Each detail has been carefully thought through and helps tie the Red berry and navy theme together. The flowers for this shoot were put together by Hertfordshire based Iris design. Unbelievably all of the flowers used were silk, but they look incredibly realistic. Each of the designs incorporate the bold red berry and navy colour scheme and the bridal bouquet is stunning! I absolutely love everything about the flower girl images from this shoot. From her beautiful navy dress from the TuTu Fairy to her beautiful bespoke flower crown from Rachel Louise bridal. Her gorgeous flowers work really well with the strong navy blue colour of her dress. Children in weddings are always adorable and it’s great to have some beautiful images of them on your wedding day to treasure as they grow up. All of the photographs were taken by local luxury wedding photographer Lee Rushby. Inspired by fashion photography, Lee’s signature style shines through in these images. Capturing the natural moments along with the more posed, stylised shots. Lee captures moments that can be turned into artwork in your home. I recently interviewed Lee to find out more about the inspiration for his photography, you can click to read the interview here. A wedding video can often be an after thought, but it shouldn’t be. A wedding video captures the moments that a photograph can’t, the sounds of voices and laughter, the way the dress moves and the moment the cake is cut. Hertfordshire based Louise Shrigley wedding films has captured every moment of this gorgeous photo shoot on film, as she would for a wedding. From the preparations through to the final shots, you can see it all in her beautiful film below. All of the suppliers featured in this wedding shoot are based within Hertfordshire and the surrounding counties. To find out more about how they could help with your wedding day, visit their websites by clicking on their names below.